Jenia Geniune Leather Cuff Bracelet - Snowflake Alloy Beads and Crystal Bangle Women Jewelry for Christmas Gift - with Magnetic Buckle and Gift Box is exquisite workmanship, cute style for women and girl. The jewelry's genuine leather design is available in 5 beautiful colors variants, namely Gray, Blue, Yellow, Black, and Red; making a perfect blend for all outfits and occasions, and can be worn as an everyday jewelry by elegant ladies. Also, the perfect finishing of the jewelry's rope cuff bangle, as well as it's magnetic alloy buckle will enable it to stay fastened and comfortable on you, all-day long. Having a total length of about 7.48" with a magnetic clasp of 1.06", this product has a perfect weight of just 26g, making it a statement jewelry of choice! The jewelry's stylish gift box makes it a perfect gift item for elegant ladies, moms, wives, and lovers. Also great as a birthday present, as well as for graduations, holidays, Christmas celebrations, or any gift giving occasion. Dress Uniquely and in Style! Click the "ADD TO CART" button at the top of the page to order your Jenia Geniune Leather Cuff Bracelet - Snowflake Alloy Beads and Crystal Bangle Women Jewelry for Christmas Gift - with Magnetic Buckle and Gift Box ! ❄❄ Jenia's leather wrap bracelet made from premium grade quality material 100% geniune leather; unisex comfortable design when you wear it can perfect blend your dress in any occasion. ❄❄ The Elegant of the jewelry's handmade leather bracelet, as well as it's magnetic alloy buckle; length is 7.48nch(19cm), width is 1.06inch(2.7cm) suitable most wrist. ❄❄ Exquisite, fashion design of The cuff bangle , and come with shine crystal and exquisite pearl snowflake accessories wear it show your unique person charm in anywhere. ❄❄ The jewelry's stylish gift box makes it a perfect gift item for elegant ladies, moms, wives, and lovers. Also great as a birthday present, as well as for graduations, holidays, Christmas celebrations, or any gift giving occasion. ❄❄ DO FALL VICTIM TO IMITATIONS! 100% SATISFACTION and Money Back GUARANTEED when you buy our products directly from us. 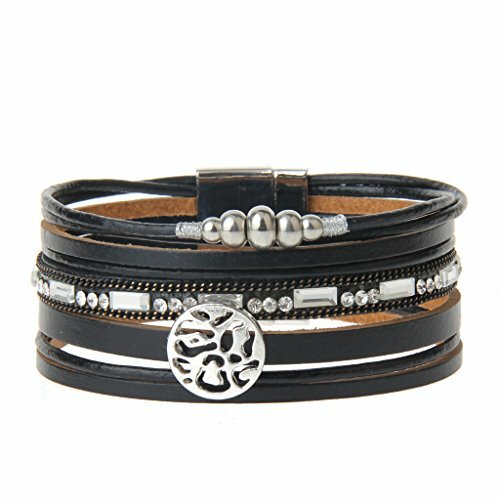 Click the "ADD TO CART" button at the top of the page to order your Women's Snowflake Leather Bracelet !